On this hunt, I was using my Verwoest Precision Automatic 243WSSM AR15 (a rifle I built) with Winchester factory loaded 95gr XP3 ammunition..."
Nice! I am also a fan of the wssm. Congrats on a good shot and successful hunt. I am envious. Thanks guys. We took a 25WSSM AR15 on an elk hunt with us this year. Unfortunately, we struck out. We saw a lot of animals though and I had one really good opportunity at a shot, but I just wasn't able to put it together. I was very impressed with the 95gr xp3. 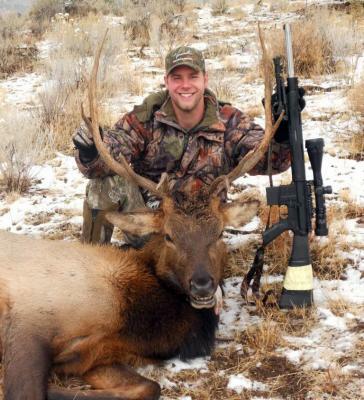 At 350 yards it still was able to pass clean through the elk. Pretty good for a 95gr bullet!